on the advancement of human knowledge. In 1610 Galileo saw too much through his telescope and earned a date with the Inquisition. 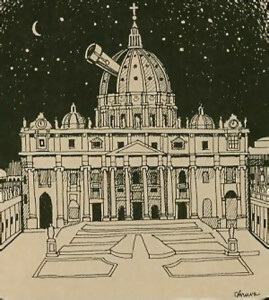 Catholic theologians in Rome, not wanting to risk seeing something that might shake their faith, refused even to look through Galileo’s new-fangled lenses. But times and popes have changed. 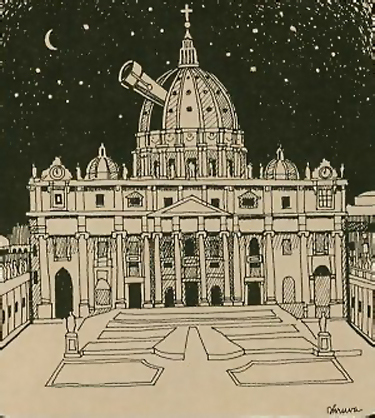 Now the Vatican, through its Pontifical Academy of Science, is actively soliciting advice from hundreds of the world’s leading scientific brains. Heralded as organized religion’s most elaborate mechanism ever to interface with science, the Pontifical Academy boasts a permanent roster of seventy-one experts—twenty-six are Nobel Prize winners—all elected for life. Followers of the Vedic scriptures appreciate the pope’s broad vision and honesty. Already the pontiff has personally received several Bhaktivedanta Book Trust editions of Krsna conscious literature, including two in his native tongue. ISKCON’s founder and spiritual guide, Srila Prabhupada, always declared that although the comprehensiveness and depth of scriptures vary, the essence is the same, just as one plus one equals two whether in pre-school arithmetic or in university calculus. The university scholar, however, has grasped all the profound complexities of mathematical science; and likewise, the Vedic scholar has the most complete understanding of material and transcendental phenomena. If Vatican dignitaries probe into the vast volumes of Vedic literature, the elaborate science of the Lord’s engineering will be at their command. Especially the Srimad-Bhagavatam lavishes on the student principles and details of not only the material cosmos but also the paradisiacal universe outside the realm of matter and time. The entanglement of the living entity in material existence is minutely analyzed side by side with the technology of spiritual liberation. The Church’s reliance on scientists’ limited, imperfect intelligence has severe disadvantages. Last year a seminar of twelve scientists convened by the Pontifical Academy concluded that “masses of evidence” from paleontology and molecular biology support “beyond dispute” the concept of human evolution. Yet even a layman knows that the concepts comprising neo-Darwinism are in hot water. In 1980, many of the world’s most erudite geologists, paleontologists, molecular biologists, embryologists, and population geneticists gathered in Chicago for a summit conference on evolution. “Personality clashes and academic sniping created palpable tension in an atmosphere that was fraught with genuine intellectual ferment,” reported Science. “The proceedings were at times unruly and even acrimonious.” Although the renowned experts attending the historic conference certainly held faithfully to certain concepts of evolution, they bitterly clashed over how evolution might have occurred. And no one could present any direct evidence that it had occurred. Vedic scholars would furthermore request these scientists to kindly explain the origin of consciousness. Without consciousness one cannot be aware of anything—not even of the atheistic doctrines of modern science. Yet evolutionists, wrangling over micro-changes in bodily limbs and organs, refuse to acknowledge their inability to account for consciousness, the most important feature of the living being. In the Bhagavad-gita, Lord Krsna, the Supreme Personality of Godhead, announces to the tiny-brained empiricists of this world: “Now I will teach you in full, knowledge of both material and spiritual phenomena. 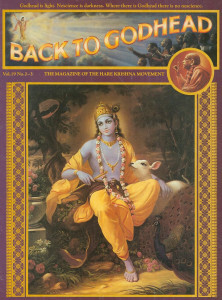 You can be sure that having mastered this, nothing further shall remain for you to know.” Therefore the Krsna consciousness society cordially invites religionists and scientists alike, from all walks of life, to take shelter of Vedic knowledge, as taught by the supreme theologian and scientist Himself.